Within Foldr Settings >> Security >> Use Foldr the Foldr administrator can control which users/groups are permitted to use any of the Foldr apps (applies to web, mobile and desktop). There is an additional permission for ‘Use Foldr Drive‘ on the same screen to control access via a WebDAV client. As with the permissions tab found within Shares, Use Foldr will by default contain the built in ‘Foldr Users’ group with an ‘Allow’ permission to both Foldr and Foldr Drive. Foldr Users = Everyone and as such will allow any user with valid credentials to sign in. To restrict access to Foldr and only permit one or more specific Active Directory groups, remove the Foldr Users item and Click ‘Add User or Group’ to search for the LDAP users or groups that you wish to apply the ALLOW permission. Note that Foldr will only search the domain within the scope the LDAP Search DN configured in the General section. ‘Deny’ entries always override ‘Allow’, the exception being where individual user permissions override groups. To provide support for existing and future product functionality (such as integration with other services), Foldr v4 automatically stores user’s passwords once they have authenticated. Passwords are stored within an internal database and all values are encrypted using OpenSSL and the AES-256-CBC cipher. Furthermore, all encrypted values are signed with a message authentication code (MAC) to detect any modifications to the encrypted string. By default the Foldr appliance will delete a users cached password after 2 weeks of inactivity. This is configurable within Foldr Settings >> Security >> Passwords >> Cleared cached credentials after a period of inactivity. In Foldr v4 administrators can optionally deploy Foldr so that the database containing configuration and other data (such as user credentials) is stored on a central, non-internet facing system and all user interaction takes place via satellite client access appliances. The administrator has the option to disable storing users passwords completely. This configuration would require the use of a service account to be configured on all SMB shares and enable the setting ‘use service account for all access’ on the share. The appliance would then connect using the service account on behalf of a user making the request. There is an additional setting labelled ‘Enable full ACL support’ to parse a users individual NTFS permissions so they receive the appropriate level of access to the shares. Foldr v4 now provides users with Active Directory password control and password expiration handling for users connecting via a web browser or the native iOS / Android apps. Users are able change the network password at a time of their choosing from the web, mobile or desktop apps. Another benefit to enabling If the organisation has a password expiration policy, and a user attempts to log into Foldr using an expired password they will be prompted to change it. 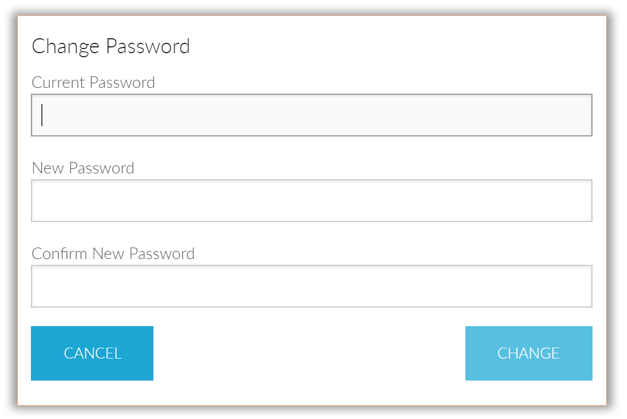 If the ‘user must change password at next login’ flag is enabled for a user on the domain, Foldr will also allow the user to change their password as they log in. By default, password control is disabled, however the administrator can enable this feature within the Security >> Password Settings tab. Foldr v4 includes an automatic rate limiting feature that will prevent a user to log in if they have repeatedly failed authentication. This feature has been designed to mitigate against malicious attacks on the service. A reverse proxy removes the need for a dedicated public IP address when accessing Foldr externally. This brings obvious benefits however you may notice that the client IP address shown in the Foldr audit logs is incorrect. This is due to the fact that the source IP address of all network packets that reach the Foldr appliance(s) are showing the address of reverse proxy / firewall rather than the client’s actual IP address. To resolve this, you should configure your reverse proxy / firewall to enable the X-Forwarded-For HTTP header for all traffic destined for your Foldr appliance(s). Once this has been done and the IP address of the reverse proxy / firewall / load balancer has been configured within Trusted Proxies, your Foldr audit will display the client’s actual IP address in the logs. More information on X-Forwarded-For header can be found here. If your network environment uses a reverse proxy / web publishing service to present Foldr externally, the IP address of the LAN facing network interface(s) on the firewall or other device performing the reverse proxy service should be entered within Appliances >> Trusted Proxies. Mobile devices (iOS & Android) running the native Foldr app provide the ability to enforce passcodes, PIN or TouchID to protect access to corporate resources. Foldr also provides the ability to store credentials to allow convenient login from these devices (using best practices such as the iOS keychain and Android private shared preferences). However, in the event of a mobile device becoming lost or stolen it should be considered important to remove the ability to sign in from the lost device, or continue a user session if the device is running a session of the Foldr app and it is already signed in. 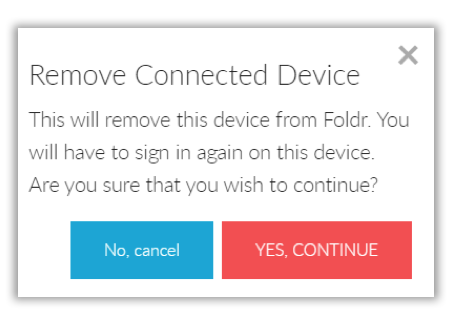 After clicking YES, CONTINUE the device will be revoked and anyone using the device will be unable to log in, even if credentials are stored. Should they attempt to use the app (and connect to the appliance or interact with it if already logged in) the users account profile in the app is also automatically removed.